Last Saturday after a spell of fairly calm weather, the wind suddenly got up. By the following morning it was already dropping away but the sea along the Purbeck coast had coloured up a fair bit and the water was still quite choppy. When Nigel rang to ask about fishing over the high water period that evening we decided that bait fishing on the ledges would be our best bet. 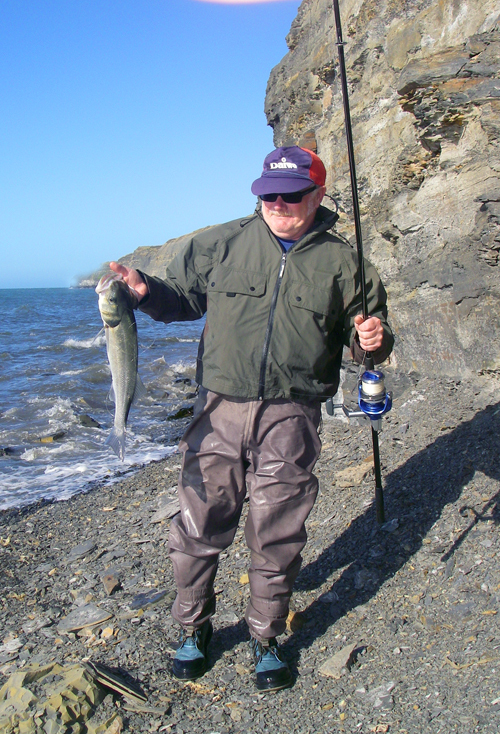 We arrived at the shore half-an-hour before high tide each of us armed with a rod, fixed spool reel loaded with braid, size 4/0 circle hook and a small bag of mackerel heads and fillets. 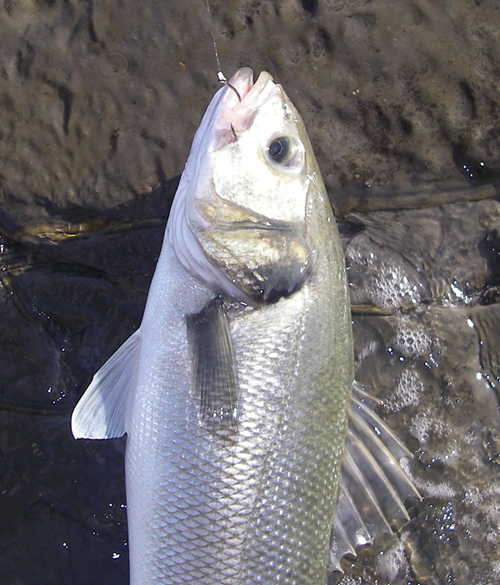 Within seconds we were baited up and stood side by side, on the ledge, knee deep in the surf, with our baits washing round in the shallow, murky water. It was perhaps fifteen minutes before Nigel said he had a bite. The line ran out, the fish stopped for a few seconds and then it began to move off again. 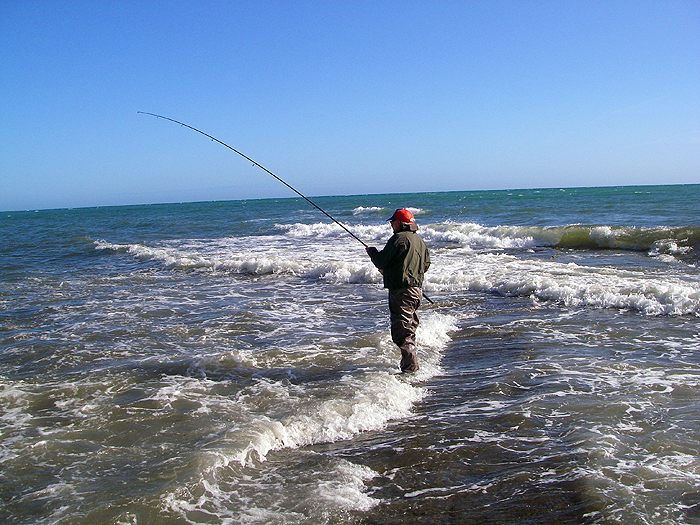 As soon as his line tightened and the rod began to bend I reeled in and made for the shore to pick up my camera. The bass put up a spirited performance in the rushing waves so I had plenty of time to take a few pictures as my pal walked his fish ashore, beached it and removed the hook. Excellent! Soon we were out there again, pleased about having made a good decision about the place to go and the tactics to use. Of course we may have been able to catch more or bigger fish elsewhere but it's always nice when a plan comes together as they say. In the next hour or so I never had a bite but Nigel had two more nice bass, both neatly hooked in the scissors on the circle hook. 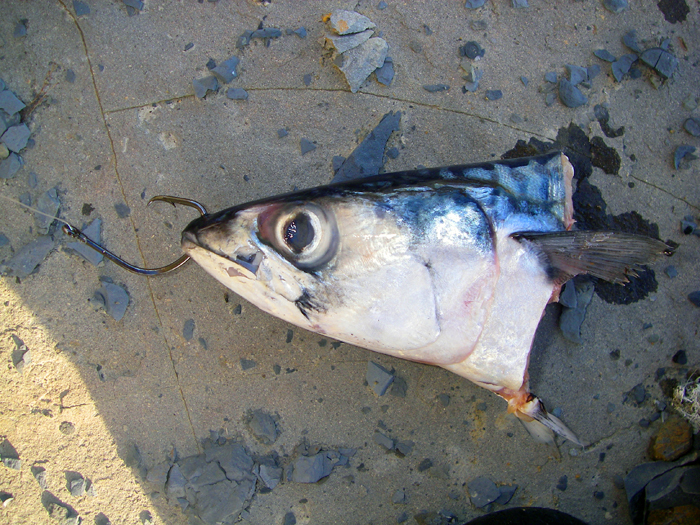 The first took another a mackerel head and the second one golloped down two decent sized fillets. We were fishing with more or less identical gear and baits in the same spot so I guess the fact that Nigel had three to while I went fishless was down to chance. That's my excuse anyway. As we said on the walk back to the cars - "We don't do enough bait fishing!" 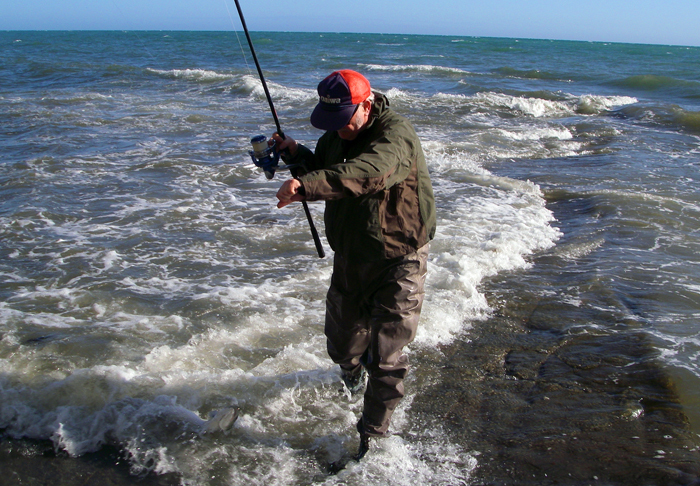 It's equally as exciting and enjoyable as any other method, particularly when you are using no lead and holding the rod all the time.